Fangirls, this is a gorgeous and intense series. 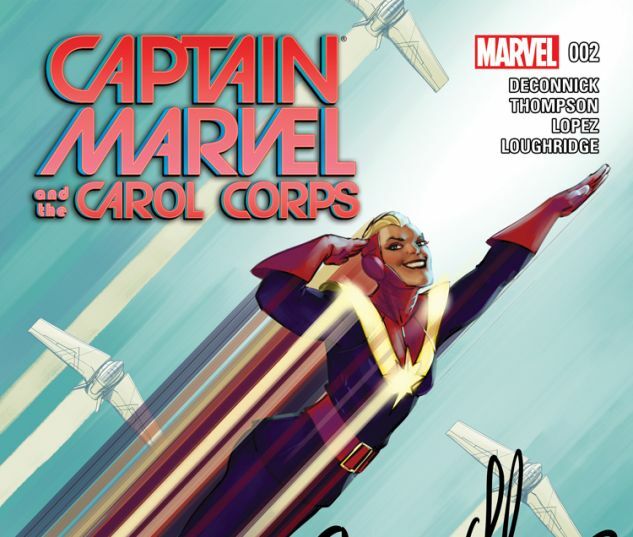 Two issues in, and I’m concerned about characters other than Captain Marvel, because they’re well written and shown as important. It’s wonderful seeing not just Carol written well, but a whole team of women. In issue two, it’s released that the saved man is Captain Rhodes, whom you may know as Rhodey. He was a big part of Carol’s life in DeConnick’s Captain Marvel series, and is now getting involved on this bizarre Doom planet. Carol brings in a doctor to check on him. They find that he has an infection, so the doctor leaves some antibiotics for him. She also leaves a warning; it’s dangerous to be hiding a fugitive right under the Baroness’s nose. The Carol Corps devise a plan; have their planes retrofitted as rockets, fly into the void (sky), and see what lies beyond. There are many suspicions that it isn’t full of nothing. But at the end of the issue, when Helen decides to take hers out for a spin without clearance, they find out that the rockets aren’t ready. The issue ends with an explosion, as Helen’s rocket doesn’t make it too far off of the ground. 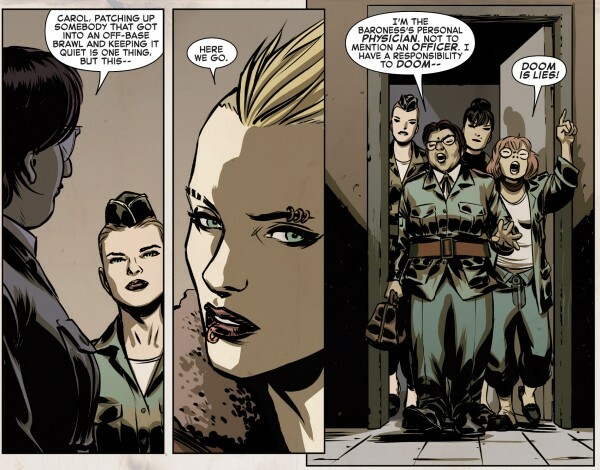 This issue was wonderful, because Helen’s death took me by surprise, and showed me just how much I cared about her (which I honestly didn’t really expect). It’s also nice to see that it was Rhodey that was rescued from the wreckage, and I’m excited to see more of his interactions with Carol. I don’t necessarily want them to fall in love, but I’m excited to see them together more. Altogether, it was a great issue, and I can’t wait to pick up the next ones when I finally get back to Earthworld next weekend!